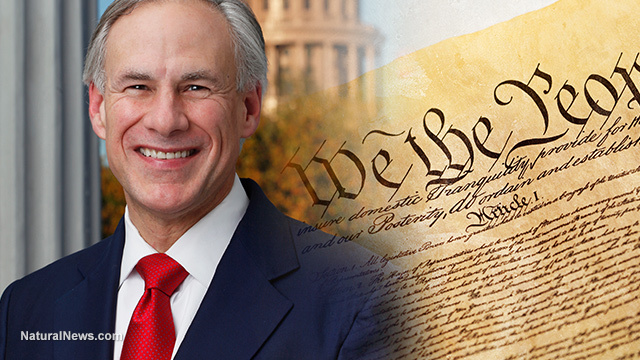 (NaturalNews) Texas Governor Greg Abbott, a rare champion of freedom and liberty, has announced a bold plan to add nine new amendments to the U.S. Constitution. These amendments would protect states' rights and individual liberties while halting the malicious encroachment upon those liberties by a federal government that's increasingly run like a tyrannical police state dictatorship. 3) Grant states the power to override the U.S. Supreme Court with a two-thirds majority vote. This is designed to reel in the insane corruption of the Supreme Court that we witnessed with decisions on Obamacare in particular (Justice Roberts chose to ignore the meaning of words and the law in rendering his truly insane, demented decision). 4) Require a supermajority of 7 Supreme Court justices to override any law passed by state or federal legislators. What's missing from this list that needs to be in the U.S. Constitution? A health freedom amendment that protects the rights of citizens to be free from coercive medical interventions (forced chemotherapy and vaccinations) and to be able to choose the health practitioner of their choice, especially if that person is a holistic, alternative or naturopathic practitioner. The treatment of cancer patients with pioneering, advanced medicine treatments need to be decriminalized. (Right now, healing cancer patients is a crime in America.) And the licensing monopolies of the state medical boards needs to be shattered. Furthermore, American citizens need to be protected from being labeled "mentally ill" by doctors and subsequently having their own rights and constitutional protections stripped away from them. Earlier this week, Obama granted doctors the power to call the FBI and place anyone on a "no guy buy" list merely by labeling them mentally ill (based entirely on OPINION, not science). Insane liberal leftists would also want to add all their own delusional amendments to the Constitution, no doubt asserting that the First and Second Amendments need to be stripped away entirely. The left's war on free speech and gun rights is part of their play for a totalitarian government regime with absolute thought control, speech control and gun control. They despise the fact that Americans still have protections for free speech, and they want to destroy that right for anyone who disagrees with their own warped opinions. So much for "tolerance," huh? I can see leftists trying to push for constitutional amendments that would eliminate states' rights, destroy individual liberties and demand special protections for felony criminals, rapists, organ harvesting abortionists, illegal aliens and terrorist refugees... all groups that are now supported by the left, of course. Is this Gov. Abbott's plan for Texas secession? From a practical standpoint, I don't think there's any chance that a constitutional convention will succeed in passing amendments that take away power from the federal regime. My honest assessment is that Gov. Abbott is proposing this knowing it will fail, planning on citing this attempt as a "last ditch resort" before ultimately declaring Texas' secession from the union if things continue to worsen. What people outside of Texas don't know is that most Texans are ready for Texas to declare itself a new nation. In fact, they wish for it. An independent Texas would be economically strong, militarily dominant and culturally intact. Once Texas secedes, many other states would likely join the effort. The best way to let leftists and liberals learn the lessons of how insanely stupid their ideas are is to let them run states like California into the ground while distancing ourselves from their stupidity. That's also why Northern California is desperately trying to break away from Southern California, by the way. However, if Hillary Clinton wins the White House, expect Texans to rapidly move in the direction of disconnecting from the insane, corrupt, criminal federal regime that would be run by Hillary Clinton and her band of violent socialist haters who literally want to imprison or execute anyone who disagrees with the Clintons. What's my opinion on all this? I'd be thrilled to call Greg Abbott my President. He's a man with principles, vision and real courage. And those qualities are sorely lacking across the political spectrum today.